How many times have you wondered why a word is spelled a certain way? Or why letters are silent? These two books address just that. One is a narrative nonfiction about trying to make English easier to read and write. The other pokes fun at the odd words that still haunt us. 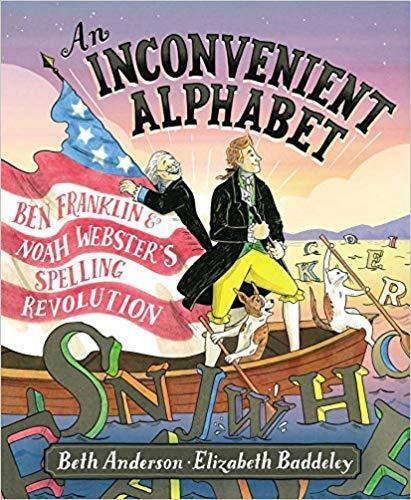 An Inconvenient Alphabet by Beth Anderson and illustrated by Elizabeth Baddeley is a spirited look at the American patriots who attempted to lasso the different spoken languages into one American English language. Ben Franklin created a new alphabet trying to match letters with sounds. He did away with letters like c, j, w and y. Another man, Noah Webster created a book to teach people how to pronounciate words so people would sound words in the same way. Anderson, a former English and Second Language teacher, is the perfect person to write An Inconvenient Alphabet. I know Beth through the Fort Collins Society of Children's Book Writers & Illustrators group and was at the meeting when she announced she had sold her first manuscript, so I'm proud of my fellow Coloradoan author for coming out of the starting block with a top quality story. Baddeley's illustrations bring a lot of energy to a subject that kids typically would roll their eyes at. All ages. When writing alphabet books, there are always those stinker words that start with the letter you're trying to demonstrate, but that don't have the correct sound such as pterodactyl! That's the name of the worst alphabet book ever, aka as the funniest evah! 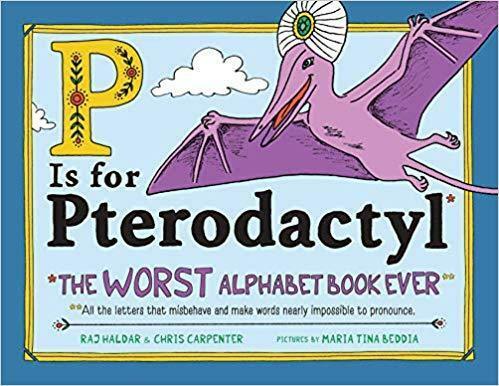 P is for Pterodactyl: The Worst Alphabet Book Ever takes those words that are hard to pronounce and puts them on front stage with silly drawings and sentences to show how ridiculous words in our English language can be. Give these two books to kids who are struggling to learn the language and they'll see why they're not alone! Poor spellers will rejoice in being able to point to why they are having troubles. And who can blame them? To learn more about Beth Anderson go to her website.